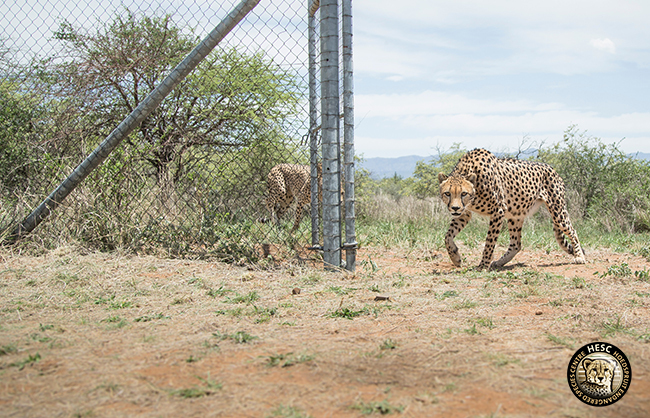 On the 2nd of December 2015, we released two of our male cheetahs, Tobie and Wim, onto the Air Force Base Makhado. We donated these captive-born cheetahs to the Air Force Base to keep the runways clear of small game for the safe landing of aircrafts on the base. Seven year-old Tobie and six year-old Wim were fitted with GPS collars at HESC on the 17th October 2015 to enable the tracking of their movements once released. On the 20th October 2015 they were transported to the Air Force Base and released into a large holding area adjacent to the runway so as to acclimatise them to the sound of aircrafts and their new environment. A sizeable media and Air Force Base contingent joined us for the release. 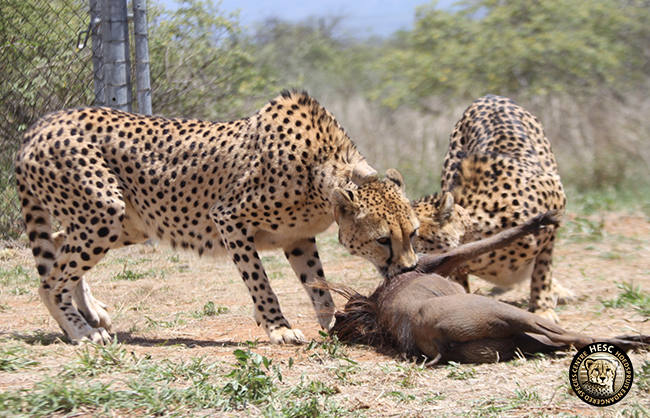 As a result, the cats retreated to their enclosure shortly after being lured out with a warthog carcass. We left them and returned about an hour later, with only essential personnel. 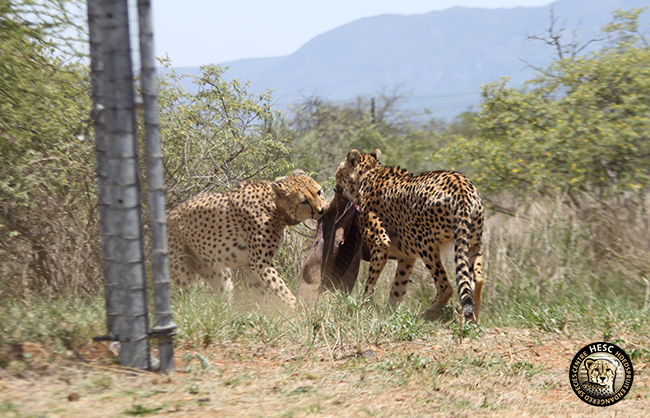 The temperature had also cooled down and the cheetahs were close to the entrance of their enclosure. This time when they were lured out, they did not attempt to retreat. Once they were out in the open, Tobie continued to enjoy feeding on the warthog. 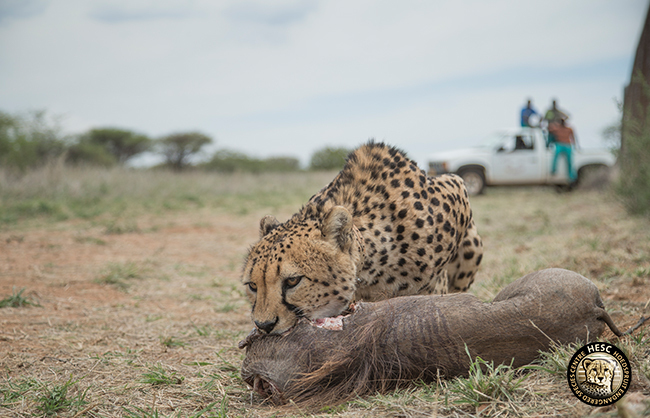 Wim was a little more sceptical of us (in typical Wim fashion), but he eventually joined Tobie at the Warthog carcass. He continued to keep a close watch of everyone through a sharp eye before grabbing the warthog and carrying it into the veld in a shaded spot. We watched them for a while, and then left to give them time to finish off their meal and to start to explore their new home. Commenting on the value of the cheetahs to the Air Force Base Makhado, Lieutenant Colonel Etienne van Blerk said; “The use of cheetahs to hunt small game on the airstrips is a unique method of clearing the runways. Above all, it is a natural and sustainable means of ensuring the safety of the area”. 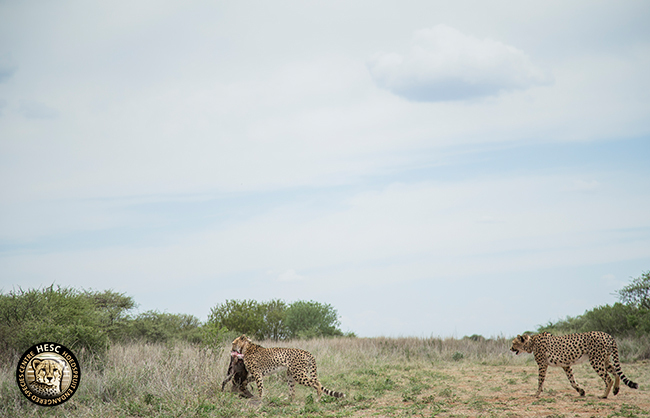 “This kind of release dispels the myth that cheetahs born in captivity cannot be released into the wild to hunt for themselves,” said Lente Roode, founder of the HESC. 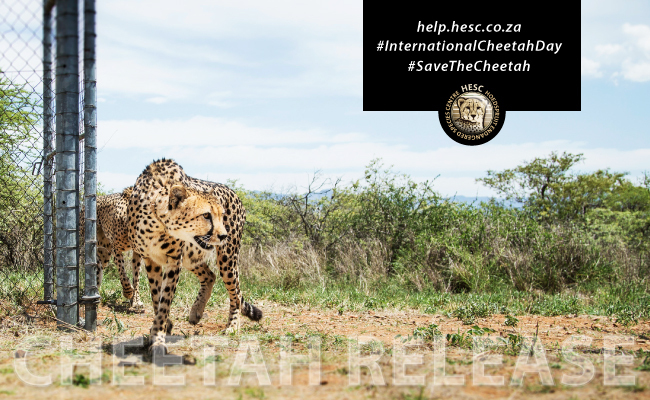 She added; “While much of the work of the HESC is focused on breeding cheetahs and creating a large and healthy genetic pool to sustain the species, the release of cheetah into the wild remains the ultimate objective and measure of success”. With fewer than 10 000 remaining in the wild, the cheetah is sadly Africa’s most endangered big cat. However, the good news is in South Africa the cheetah is no longer classified as endangered, but as vulnerable. The designated Air Force officers will closely monitor these cheetahs’ movements, and we will be sure to update you as to how they are doing in the wild.